Grant, John Webster. "Missions and Missionaries". The Canadian Encyclopedia, 30 November 2016, Historica Canada. 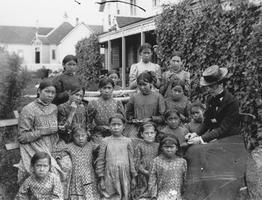 https://www.thecanadianencyclopedia.ca/en/article/missions-and-missionaries. Accessed 20 April 2019. In New France as elsewhere the christianization of the Indigenous population was an ostensible motive for European occupation, and trading companies and governors were under official pressure to provide it. The actual work was left largely to religious orders and societies. Top left, with Crowfoot, Red Crow, Three Bulls, One Spirit and North Axe, 1886 (courtesy PAA/H. Pollard Coll). Metlakatla - August 30, 1876, watercolour by Lady Dufferin (courtesy Library and Archives Canada/C-33996). Sacred Feathers was photographed in Edinburgh, Scotland, in 1845, believed to be the first photographic study of a Canadian aboriginal (courtesy National Galleries of Scotland). In New France as elsewhere the christianization of the Indigenous population was an ostensible motive for European occupation, and trading companies and governors were under official pressure to provide it. The actual work was left largely to religious orders and societies. Jesuits entered Acadia in 1611, Récollets the St Lawrence Valley and the Huron country in 1615, while Capuchins, Sulpicians, and priests of the Society of Foreign Missions were later active. Missions were eventually established in all areas penetrated by the French, including the Iroquois country and extending to James Bay, the western Great Lakes and beyond. The most celebrated of these was the Huron mission, which was reopened by the Jesuits in 1634 and came to an end in 1649-50 when the Iroquois destroyed the Huron Confederacy and killed Jean de Brébeuf and several other missionaries (see Ste Marie Among the Hurons). The British Conquest of 1759-60 cut off the supply of recruits to French agencies, and Protestants were slow to show interest in Indigenous missions. The first successful effort, that of Methodists among the Mississauga of Upper Canada from 1823, was made possible by the emergence of a corps of native missionaries among whom Peter Jones (Kahkewaquonaby) and John Sunday (Shah-wun-dais) were most prominent. Anglicans and Moravians were also active, and in 1843 the Jesuits re-entered the province. 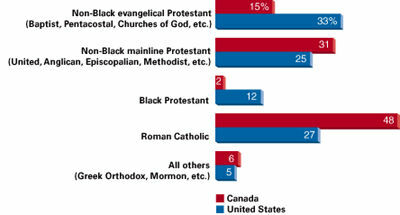 In western Canada the leading agencies have been the Church Missionary Society (Anglican) from 1820, the Wesleyan (later Canadian) Methodists from 1840, the Oblates of Mary Immaculate (Roman Catholic) from 1845, the Presbyterians from 1866 and the United Church of Canada from 1925. 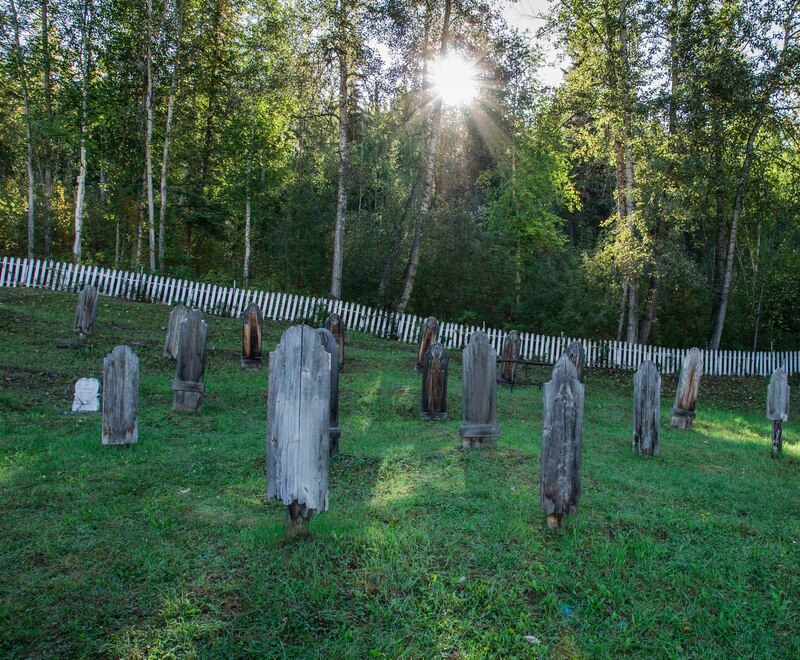 Among the Inuit the Moravians, in Labrador from 1771, have been followed by the CMS and the Oblates. While a large measure of paternalism has marked all of these missions, emphasis now is on encouraging the active participation of native Christians. In recent years many new missions have been opened, most conspicuously by Pentecostals and other conservative evangelicals. 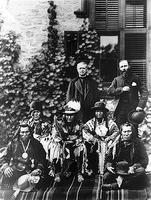 Providing religious services to white settlers also called for missionary effort. 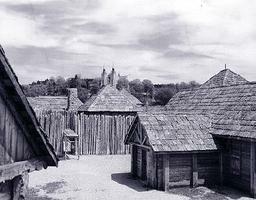 The French orders and societies that worked among the Indigenous people also served the colonists of New France. Some leading Protestant organizations were the Society for the Propagation of the Gospel (Anglican), the Glasgow Colonial Society (Church of Scotland), the Colonial Missionary Society (Congregational) and the American Home Missionary Society (Congregational/Presbyterian). 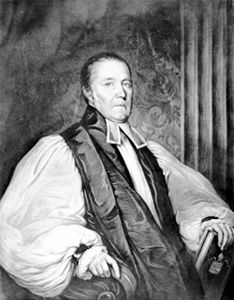 American preachers founded Methodist and Baptist churches in central Canada, while the Methodists of the Atlantic provinces received missionaries mainly from England. Roman Catholic missions, both white and Indigenous, were generously subsidized by the Society for the Propagation of the Faith, founded at Lyon in 1822. Before the middle of the 19th century, Canadian churches were sponsoring missionaries overseas. In 1845 Richard Burpee went to India with support from Maritime Baptists, and in 1846 the tiny Presbyterian Church of Nova Scotia agreed to send John Geddie to the New Hebrides. By the end of the century practically all Canadian Protestant churches supported missions overseas; that of the Methodists in west China grew to be the largest Protestant mission anywhere. The Sudan Interior Mission, a nondenominational faith mission officially organized at Toronto in 1898, was probably the largest of all Protestant missionary organizations at the time of its merger with the Andes Evangelical Mission to form the Society of International Missionaries. Since WWII Roman Catholics and conservative evangelicals have overtaken the larger Protestant churches in the scale of their missionary operations. Meanwhile the latter have moved to a relation of equal partnership with overseas churches, and much of their work is carried on in co-operation with such international agencies as the World Council of Churches. Alvyn Austin, Saving China: Canadian Missionaries in the Middle Kingdom 1888-1959 (1986); Ruth Complon Brouwer, New Women for God: Canadian Presbyterian Women and India Missions, 1876-1914 (1990); Robert Choquette, The Oblate Assault on Canada's Northwest (1995); Raymond Huel, Proclaiming the Gospel to the Indians and Métis (1996); Martha McCarthy, From the Great River to the Ends of the Earth: Oblate Missions to the Dene, 1847-1921 (1995); Robert Wright, A World Mission: Canadian Protestantism and the Quest for a New International Order, 1918-1939 (1992). Lucille TeasdaleView the Heritage Minute about humanitarian and visionary Lucille Teasdale, one of Canada's first female surgeons. From Historica Canada. See also related online learning resources.